We are all in a spiritual war, from the time we get out of bed, until we get back into it at the end of the day. The enemy cranks up the heat to spiritually drain us! There are just times when we feel like all of our strength is gone. We feel like we can't take one more step. But at that point, God can fill us up with His strength! It’s a wonderful blessing to be able to wear completely out, so God can show us His strength. Moses had the task of taking millions of God’s people across the desert into the promised land, where God wants them to be. The Israelites were pretty annoying… they were always complaining and wanting to go back to Egypt. Moses got very discouraged dealing with the people, and God was too! God suggested that He might destroy the people rather than deliver them into the promised land. Moses, though, told God he didn’t want to go if God wasn’t going to go with them. It is in God’s presence that we receive joy and strength. Moses went up on the mountain to receive the law from God and he begged to see God’s glory, to see Him in a way he’d never seen Him before. God allowed Moses to see the back side of Himself and, from that vision, he was filled up and his strength was renewed. Elijah went to fight with hundreds of the prophets of Baal. When the prophets of Baal called out to their “god,” there was no answer. But Elijah called upon God and He sent fire from heaven to consume the altar - a mountaintop experience for Elijah and for God’s people! But the high didn’t last for long because Jezebel had put a hit on Elijah to have him destroyed and he ran to hid in a cave. From the cave, he was miserable, begging God to wipe him out - his strength was depleted. Those mountaintop experiences are great, but it’s a long way to the bottom! God spoke to Elijah and gave him encouragement. As God spoke, Elijah’s strength was renewed. Having God near him and knowing that there were 7,000 other followers out there that had not bent their knee to Baal helped him. We need God, and we need other people, too. Jeremiah was crying out to God’s people, warning them of the upcoming judgement of God. Jeremiah got very discouraged because people didn’t seem to be listening and the wicked seemed to be prospering. Jeremiah gave up, he burned out, he had his strength depleted. But, Jeremiah said, not speaking the Word was like fire bottled up within him. The presence of God’s Word inside him renewed him. Samson lost his strength due to compromise and, because of the circumstances, found himself humbled by his enemies. He eventually acknowledged that his circumstances were his own doing. He prayed to God to have his strength restored, and God saw fit to give that strength back. His greatest work was when his strength was drained and then renewed. Even John, who Jesus said was “greater” than any man born to a woman, was discouraged and weakened at a point, needing strength when he was too weak to do it on his own. 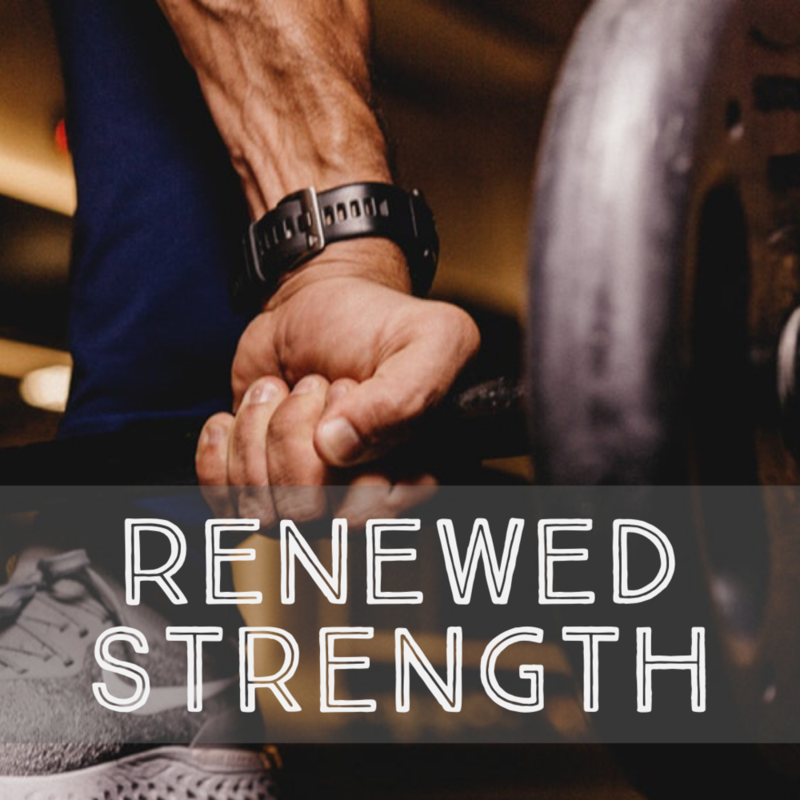 When his vision of his purpose and the purpose of Jesus’ life was restored, his strength was renewed. When we get our focus in the wrong place, things don’t work right. If you are trying to work your abs, but when you do crunches, you’ve got your neck strained, trying to pull yourself up, it hurts. You can’t work your abs with your neck! You have to relax the other parts, and just focus on what you’re working on. In our lives, we get stressed and have trouble dealing with all the things we have going on, we just need to relax all the temporary things, and focus on the one thing that is eternal - God. Focus on your work for Him and your role in His kingdom, and you’ll have your strength and joy renewed. If our “inner man” is strong and focused, our bodies can take just about anything. Psalm 73:26 - My flesh and my heart may fail, but God is the strength of my heart and my portion forever.